5 Best Bottle Labeler Machines (2019 Review) Our TOP Picks! At some point, you may decide to start labeling your own beer bottles. What you will quickly realize is it isn’t as easy as it looks. There are many different shapes and sizes of bottles, and there are just as many, if not more, shapes and sizes of labels. It can be challenging to get the label perfectly centered and straight. And it can be even more difficult to be consistent bottle after bottle. It can be a very tedious process and take up a lot of your time. Getting yourself a bottle labeler is a solution to this problem. Bottle label applicators are used to quickly and efficiently label bottles. 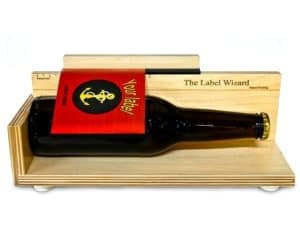 They will save you time and keep a consistent placement bottle to bottle, which is important if you are personalized beer labels or custom beer bottles. This is important as the aesthetics of your beer can be just as important as the taste. There are a wide variety of bottle label machines. Some are very large and designed to be used in a commercial setting where you would be bottling hundreds or more bottles a day. Others are more appropriate for at home or small craft brewery settings. However, regardless of the size and output of a bottle label machine, they all work in about the same way. For our home brewers and business startup followers, I have reviewed some of the best beer bottle applicators available for you to consider. They are very convenient and combine the means to label with speed and accuracy. The Maxwolf is by-far my favorite for many reasons. 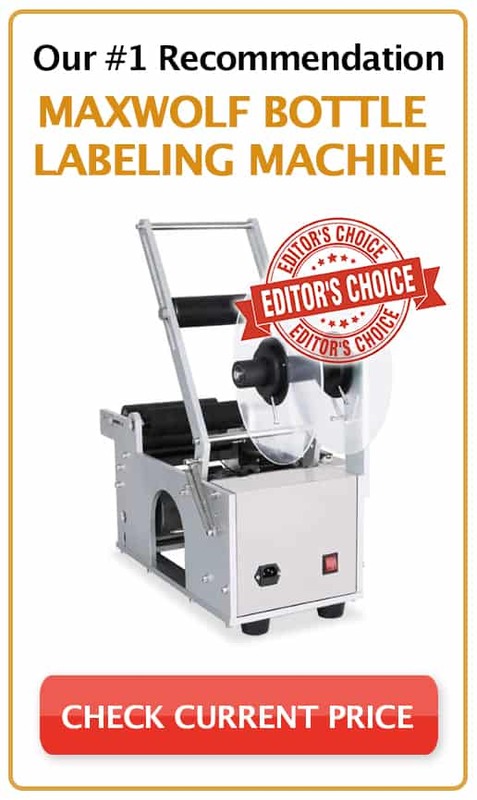 This labeling machine is extremely versatile and even more efficient. 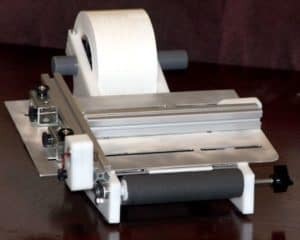 It has a similar design to the International LAB01 (which gets great reviews); however, it is semi-automatic which makes processing quick and easy. It has an electrically powered motor that makes for fast application, and it can be calibrated for pinpoint accuracy. 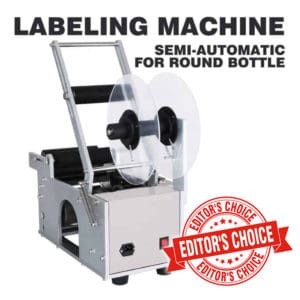 This will save you a lot of time as it can label 40 round bottles (12 – 90mm) a minute. It is also very easy to set up and designed for easy maintenance. As you can see in the title, the Zap Labeler is a very versatile machine for beer bottles. It can label round, square, hex, and oval bottles as well as pouches, bags, and boxes. This is a huge advantage in my mind. This way you can label beer, wine, and liquor round bottles as well their packaging. The supported label sizes range from 5 to 8 inches, and they can be easily switched out. Like the International LAB01, this is also a manual machine. It also takes some adjustment to get going but once it does it is a great tool for both small and large batch brewers. This is a manual bottle labeler. It is easy to operate and can label most bottle sizes. Being that it is a manual label machine, you have to load and turn each bottle. This is not a bad thing. It just means that you won’t be paying thousands of dollars to apply your labels. 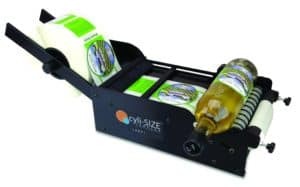 To operate, you load the roll of labels, place a bottle on the rollers, turn the bottle until the application is finished, and then load the next bottle. Within minutes you can apply 50 or more labels. This is perfect for someone looking to label at home. 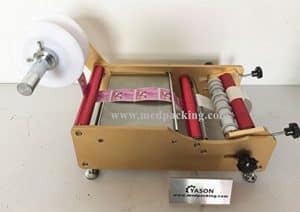 It is very inexpensive, and you will save hundreds of dollars compared to other manual label machines. There is no assembly required, and you’ll find it makes labeling much easier and more accurate than freehand labeling. This bottle labeler machine is as basic as they come. It is essentially a quartered rectangular wooden box with a measuring tool. All you have to do is rest your bottle on the frame and use the measuring tool to center your label and then apply. This bottle label applicator is designed to apply adhesives to round bottles. It is manually operated, supports up to 8-inch-wide labels, and can hold hundreds of labels. Although, this labeler is manual it can still crank out up to 1000 bottles an hour. There is a crank and handle that makes for fast application and can apply as fast as you can load the bottles. Easy Labeler also offers additional attachments to support bottles with unique shapes and bottleneck sizes. Easy Labeler also guarantees their parts and workmanship, and offers a full refund within 30 days for any dissatisfaction. This, in turn, will save you a lot of money and will greatly increase your return on investment. However, depending on your immediate needs you may consider going with a manual labeler. Manual operated bottle label machines are still going to save you a ton of time. And like a Semi-automatic, you will have the advantage of label accuracy. The biggest advantage is that you can save some money when you go with a manual operator. Semi-automatic machines can save you time on every bottle – a big advantage if you are going to be running a business. If you are a casual brewer and only need something cheap to get the job done, I would go with the Label Wizard. It can be extremely helpful in keeping your labels square and will save you time in the end. However, for a larger output, I recommend going with Maxwolf’s semi-automatic bottle labeling machine. It will cost about the same as the manual operators and cuts out monotonous labeling maneuvers. It also supports hot stamp ribbons which can be used to apply print without a label.